Get on the FastTrack to a college education! 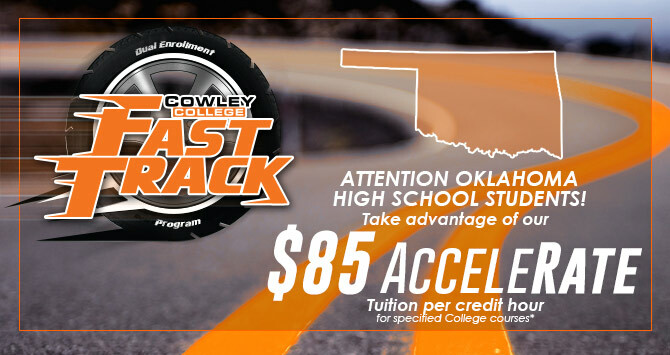 Cowley College’s dual enrollment program lets you start earning college credit while still attending high school. Our special tuition rate helps you supercharge your coursework without breaking the bank. Cowley College waives your general fees and online course fees. AND our new textbook rental programs saves you up to 60% in textbook expenses. Whether they’re taught on our campus or online, a variety of courses are eligible for our $75 AcceleRate. Most courses are also guaranteed to transfer among all Kansas public post-secondary institutions. For a PDF listing these courses, click here.